Last Wednesday was unseasonably warm. Since it’s February in New England, it should be extremely cold. But that day it reached 65 Fahrenheit (18.3 degrees Celsius). It looked, smelled and felt more like a lovely, late spring day. 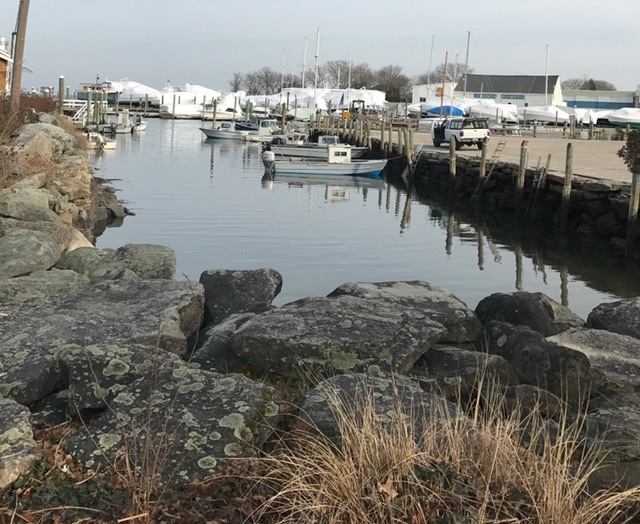 Some friends and I decided to take advantage of the break in winter and go to the historic seaside village of Wickford to walk around and enjoy a leisurely lunch in the sunshine on the deck of the Beach Rose Cafe overlooking Wickford Cove. 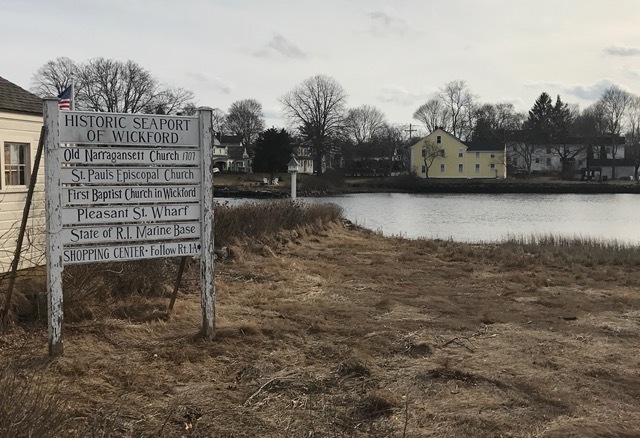 Wickford was settled around 1641 by Richard Smith on land originally purchased from the Sachem Canonicus by Roger Williams, Rhode Island’s founder. It grew as a port and a shipbuilding center. Captain Lodowick Updike inherited the land from Smith and developed much of the village between 1709-1715. Many of the homes, churches and businesses bear historic plaques which date back to that time. The buildings are largely intact and on their original foundations and comprise one of the largest collections of 18th century dwellings in the northeast. It was a fantastic afternoon with old friends, filled with laughter. That evening we sent each other photos of our day together. Wednesday night it snowed and the next morning we woke to below freezing weather and a storm that closed schools and businesses along the East Coast. Charley and I returned to the Village on Friday afternoon to snap some “After the Storm” photos. 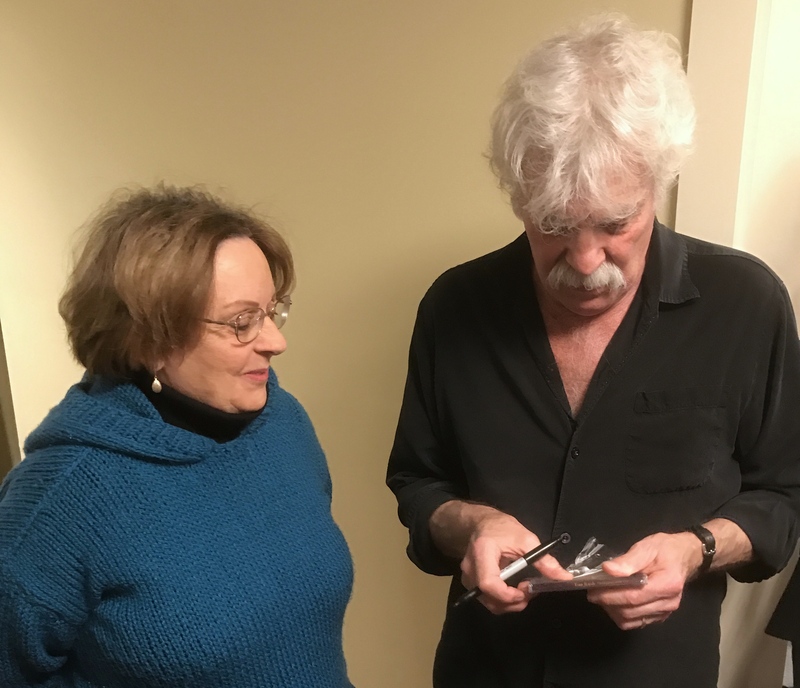 Friday night we went to hear Tom Rush perform . He’s a folk singer who’s been around since the 1960’s when we were in college. The concert began with a Joni Mitchell song. Her lyrics seemed to best describe my feelings about this week’s weather. The meteorologists are predicting another storm for Sunday through Monday. Charley and I will be snuggled up, once again, reading our Christmas books, Roxie and ZuZu in our laps, cozy inside our home in the woods. It’s the best way I know to handle the fickleness of our New England winters. Stay warm and to my friends in Australia – stay cool! You seemed to have so much fun! Yeah, weather is pretty capricious, but you made fantastic shots! I love them! Our snowfall is a fraction of yours in the Ukraine. But it is always an event which sends New Englanders into a tizzy, running to the grocery stores to get in a supply of bread and milk. Thanks for stopping by. As we speak, we are looking out the window to our 3rd snowfall of the week. Funnily enough, my part of Australia is in a brief cold snap. Last night the temperature was 8°C or 46°F. Brrr! But it will get to 27°C later today or almost 81°F. We’re hoping the cold snap sweeps over the places being hit by fire. Will give the firefighters a huge advantage. Yes, we have similar problems with wildfires out west in Arizona and California. Here on the East Coast, it’s hurricanes. Thanks, Osyth. It is definitely a matter of perspective. I just visited my friend Ann’s blog site. She’s from the Ukraine and did a video on fun in the snow. Now that is where you can really find the meaning of cold! I’ve experienced a blizzard in Moscow in May …. out of no-where from 70 degrees to below freezing in the time it took to take the metro from Red Square to Tverskaya (about 15 minutes in real money) …. I shall have to check out this lady’s blog – I’m sure I will find it enthralling and educational! She’s very sweet and dreams of becoming a film maker with an academy award. Oddly I might be able to help her with some contacts. My background was as a Literary Agent with William Morris and I am still in touch with many. Another boss is Chairman of BAFTA these days and they are VERY pro minority film-makers thank the Lord. But since you know how to swim gracefully, you can get along fine in any pond! But the weather change must have been pretty tough… try to stay warm! I’m getting comments from other countries and one of my Australian friends said they just had a cold snap in the middle of their summer. I’ve actually been in London and Dublin during a snowfall. But it melts so much faster there than here in the states. Yvette, you are supposed to be taking a bit of a respite! But I’m so glad you came to brighten up our snowy Sunday. The Village is a place you’d love. People live in all those houses with plaques and in the summer they have a nationally-known art festival along their main streets. Fun and interesting. I also enjoyed reading the lyric and listening to the song. Thank you for every delightful part of this post, dear friend. Totally crazy weather! It was warm then snow then ice! California is the place I ought to be! San Diego for consistently, beautiful, sunny weather! That’s our next trip! No, I would think you would dread it. Does he have a special place he loved? My pets are in the gardens they liked most and I talk to them all the time when I garden. Stay strong, my friend. Then maybe where Toonses sat waiting for you to come home each day? I remember when he disappeared that time and you were so upset. But he showed up eventually. I think people would be glad to know he’ll always be there waiting for you when you get home. Yup. But I’m inside and warm and I had the whole day to publish a post and then catch up with some of my buddies’ (like you) blogs. If it’s still afloat after this winter. Flood, Flood, Flood out here everywhere right now. I’ve been keeping track of the weather out there. The dam situation was pretty scary. I cannot imagine evacuating 190,000 people from one area! Don’t be rushing out here to fast. Most of the state could be under water by the middle of next week if the rain doesn’t stop. Love the photos and reading about your lovely afternoon out. We say in Scotland we can have four seasons in one day! Where we are has been very mild for most of this winter and though the last couple of days have been much colder with snow on the hills we are expecting it to warm up again this week. The weather is totally out of kilter everywhere (but there’s no such thing as climate change, right?). I think all of Antarctica has to melt and disappear for some people to get it?????? Yes, Fort William can be pretty cold. We stayed somewhere near there and had to ask for an electric fire in the bedroom. We were at the base of Glen and Ben Evers, I think??? Someone had died at the top of Glen that week and we were told that it can happen if you’re not prepared properly for the climb. The only electric fire was in the downstair’s sitting room and I hovered over it for hours before heading up the stairs. PS We are experiencing our first real food shortages – courgettes and aubergines have disappeared from the shops because of the bad weather in Spain. Lettuce, too, has vanished and garden centres are reporting a huge increase in the sale of lettuce, particularly, cos, seeds as people suddenly want to grow their own. Oh, no! This is really terrible news. But if people are going to start growing their own food, like the Victory Gardens during the War, this could be turned into a good thing. Great to get out sometimes. Love those old villages, wherever they are. great coverage, my friend. It’s okay. At least now I can find you through linked in. Did you fix that glitch with the book link? I think that was an easier fix than this. love the pictures-so beautiful! Mark Twain quotes are favorites of mine-that one was perfect! I have a bunch of them and I’ll definitely use some of them in my next “Political” post. Ethel, so very beautiful! Oh, and the village too! Seriously, y’all look like you’re having a blast!! My Granny’s house got put on Plant City’s Historical Society list! We were all so excited! Sadly, she passed away about 7 years ago. And my aunt sold the house about 4 years ago. She couldn’t afford all the work that it needed. But it has been rehabbed by its new owners I heard. I’ve been too chicken to go look. I’m afraid it would mess up my good memories of Granny. Is that silly, or what? That is so wonderful to have life long friends like that! I hope y’all are able to get together every year! Yes, friends can make this life much more palatable. I am sorry that your grandmother is no longer with you. Your Mom and Sister must be a comfort to you and I know you all have good memories of her. Some day, you should return to look at the old house. I think the memories would make you smile. Thanks, Ethel. I will try to get up my courage soon! The last time we were there, a few years ago, it snowed but melted pretty quickly. We should be so lucky around here! It sounds like autumn and winter were good times to be there. Next time we go, we’d like to golf the courses on the Ring of Kerry. Happy golfing. Kerry is a lot warmer than Donegal! Ah, but you have such lovely, warm, knit sweaters(i.e. jumpers) in donel! Yes, we call them geansai pronounced ganzee! I will remember that. Spell check turned Donegal into some other strange word, but we both know it was Donegal I meant. Don’t forget, I have an IN with the Chinese. I Skype with Milanda every Saturday. Do you think someone is listening in? Good Lord! If he is the highest authority, what does that make people who don’t recognize him as their leader! Marty, I’ve always been a Tom Rush and Joni Mitchell fan but haven’t listened to that music in a while. Charley bought me tickets to the concert for a Christmas present and so many memories floated around me as we listened to those old songs. At intermission, he came right out to the lobby and began talking with everyone. He never really took a break. It was a fun day for me. The poetry of that song is beautiful. Wasn’t the folk music of the sixties nice! I learned to play the baritone ukulele just so I could sing them. I was a big Joan Baez fan. Did Tom Rush have such a low voice when he was younger. It doesn’t go with that picture of him. Love those street signs: Love Street and Pleasant Street. That actually was taken right from the old album. He still has a very good range but there is a raspiness that wasn’t there in the old days. I almost cried when he sang that song – it is quite lovely as all of Joni Mitchell’s songs are. I’m going to a concert at Tanglewood this summer with Joan Baez, Bonnie Raitte and the Indigo girls. You know it will make a great post. I had a folk group back in the 60’s and the lyrics just come rolling back to me so easily. Lately, I’ve taken out my vinyl records, guitar and ukulele out to rekindle my love of folk music.The poetry of it is enchanting. Clare, I love this trip through Wickford with you – what a beautiful village, so well cared for, the history oozes from the photos. graduate from Harvard in 1665 – an astonishing and difficult feat for the young man. Different state and earlier century from what you’ve highlighted here, but it conveys the sense of early America. Love Tom Rush, such a gorgeous voice – thanks for the link. Sharon, One of the main settings in Caleb’s Crossing is Martha’s Vineyard, where he was born. You would love this Island, especially the section with the candy and pastel-colored Victorian houses. It does make me think of the small New England villages like Wickford. And there is much Native American history here in RI, too. I read the book long ago but should read it again. Gwendolyn Brooks is from Australia but lives on the Vineyard. You can catch a fast ferry over to the Island from North Kingstown. That’s where Wickford is. And yes, Tom Rush has a gorgeous voice and is unbelievably funny. Charley bought me his CD, “Trolling for Owls” and it has the most hilarious songs. I’m learning one now on my ukulele called “Let’s Talk Dirty in Hawaiian”. Right now, I’m trying to keep up with answering comments and have not had a chance to visit blogs, but I will visit soon. The weather is always so capricious in February and March on the East Coast. I always think of spring as a young girl trying to sneak in and drive old man winter crazy with her antics. Perfect picture! I must say I’ve always loved March. The air is so crisp and biting. I have memories of flying paper kites and getting them caught in tree limbs and telephone lines. So many colorful, tattered remnants hanging above our heads throughout the springtime! My dearest Ethel, I’ve nominated you for a Blogger Recognition Award! What a great post, Clare Mary. Love the photographs, especially the architecture. Lucky you, to live in such a place! Thanks, Kerry. There is much criticism of political corruption in little Rhode Island, but I do love it here in spite of it all. I grew up in snowy area and always say I would never move back to somewhere it snows. But your before and after pictures remind me how cool it was after snow like that to go out and play in it. I remember making snow forts on the front lawn and snow clinging to my woolen gloves. We had a blizzard out here in 1978 that brought everything to a halt for a week. It tuned the interstate into a parking lot. Ever since then, whenever the meteorologists predict snow, everyone runs to the stores to empty the shelves of milk and bread. The weather is crazy. One day it is cold and the next day it is hot. It appears you made the best of it. Great photos. What a difference a few days makes! We’re hitting 60+ today here in Wisconsin, because apparently it’s no longer Wisconsin, but some wonderfully warm and sunny place further south! And now it’s going to be at least in the 40s right til March 1 with no storms in sight!!! YAY!! Spring is on the way…what a lovely quaint town that is! We’re going to have a warm week, too. So, the dirty snow mounds will be melting. Spring is in the air! Come on Spring! I keep checking the trees for buds, I swear I see some. 🙂 Enjoy the “heat wave”. It’s almost spring around here. Charley and I planted bags of tulip and hyacinth bulbs last December and we’re looking forward to seeing them burst up through the ground. I just listened to One More Moment and watched the video. It’s so lovely! Lovely to spend time with good friends. The weather here has been almost unbearably hot with many parts of our state over 40C. Being on the coast, most times we are a little cooler. Bring on winter! Loved the video. 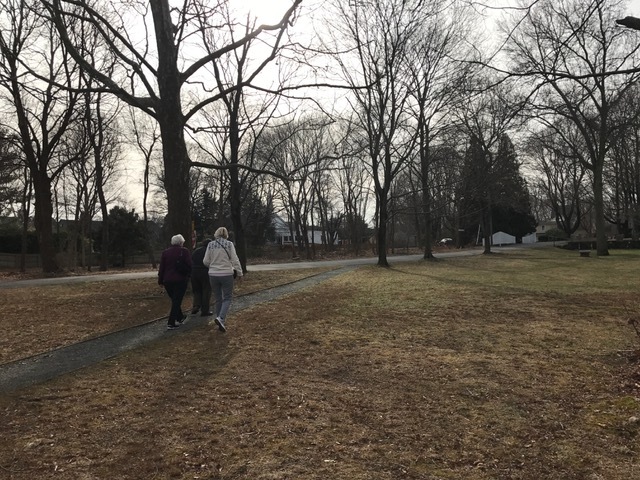 We returned to Wickford on Friday – 72 degrees F and all the snow had once again melted. Crazy! And yet some still doubt climate change science. Oh Ruth! How I miss you. There is a new book on the horizon. I get Penny’s newsletter and latest news on Face Book – so be patient. Never patient – can hardly wait. New England has notoriously fickle weather, but we’re all used to it and some even find it exhilarating! How totally pleasant and your scenic photos say it all. I love the stark trees. They look lovely even denuded of leaves. And how are you faring in Dubai? Pleasantly, I hope. Today the March winds have been howling and the snow falling here in Rhode Island. But it is almost spring and the sunlight should melt it all away soon. I read your wonderful interview with Herb and it has made him very happy. Nicely done, my friend.